Under Oath by Margaret McLean is an engaging courtroom thriller that takes us not only into the mind of Annie, but also the minds of jurors, witnesses and other key characters. These characters are very well-drawn and likeable, for the most part. Even defense attorney Buddy Clancy seems like a decent guy, despite the fact that he's defending Malone. And there are times when McLean even makes the reader feel for Malone. The interactions between characters feel real, as does the dialog. And I especially enjoyed seeing the trial from the perspective of two of the jurors. I really enjoyed Under Oath. McLean's writing is easy to read and follow, yet there are plenty of twists and moments of suspense that leave the reader guessing what's going to happen next. The suspense rises as Annie and Detective Callahan search for the evidence they need to convict Malone, even as the trial moves forward in the courtroom. The use of paintings to tell part of the victim's story is unique and brings the reader closer to Trevor, who is dead before the book even begins. 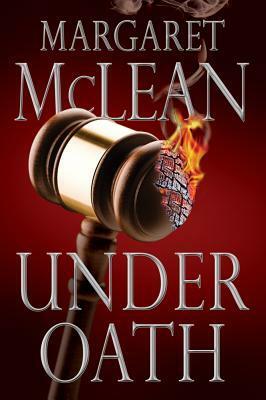 If you're looking for a courtroom thriller with interesting characters and plenty of suspense, I highly recommend Under Oath. This review was written based on a copy of Under Oath that I received from Jane Wesman Public Relations in exchange for an honest review.